Is it a jacket? Is it a hoodie? No! It's Sam's Superhero Hoodie. 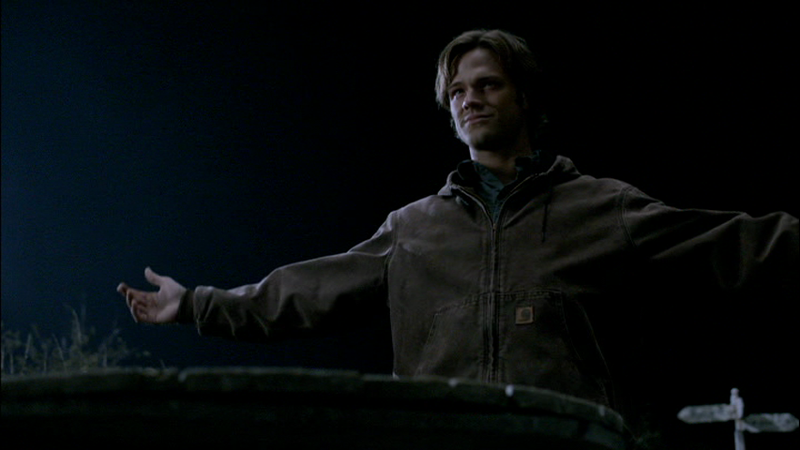 If Dean has his signature leather jacket, then Sam has his signature hoodie: the Superhero Hoodie. It’s a cozy brown hoodie-jacket with black lining. (The hoodie-jacket has been identified as a Carhartt coat). In Wendigo (1x02) Sam wears it into the woods on search day, and during the subsequent hunt. In Phantom Traveler (1x04) Sam wears the Superhero Hoodie for their second talk with Jerry and the rescue of Britannia Flight 424. 2. The shapeshifter takes it off him before tying him up in the sewer, yet leaves it nearby, because Sam is wearing it again when he escapes the sewer. 3. When visiting “Becky” after she is attacked. 4. When saying goodbye to Becky at the end of the episode. In Asylum (1x10), Sam puts on the Hoodie once they arrive in Rockford, and wear it for the rest of the episode except the very final scene when Dean’s phone wakes him up. In Nightmare (1x14), Sam puts on the Hoodie to make the mad dash to Michigan. He keeps it on for the entire episode, only taking it off when he is in the motel or wearing a priest costume. In Hell House (1x17), Sam wears the Super Hoodie when Dean and he investigate the Hell House after the “second” murder (which is actually the first actual murder). He wears it again when he explains the Tulpa to Dean at the coffee shop (and he is very itchy). In Provenance (1x19), Sam wears it when they go to the auction house to “look for Dean’s wallet”, he takes it off when they are back at the motel, but then puts it on again to run over to the old woman’s house in a failed attempt to save her. He wears it again when sitting outside waiting for Dean to find out where the guy in the painting is buried, while burning his bones, and while battling the ghost with Sarah. In Bloodlust (2x03), Sam is first seen wearing it when he and Dean arrive at the bar and meet Gordon. He wears it until after Dean kills the vampire, and then takes it off when he gets to the motel room after leaving Dean and Gordon to their celebratory drinks. He does not wear it again for the rest of the episode. In Children Shouldn’t Play With Dead Things (2x04), Sam is wearing it at the very end of the episode, when Dean admits his suspicions about what happened to their father. In Simon Said (2x05), Sam wears it from the beginning of the episode until he gets to the Roadhouse – then he takes it off sometime while Ash is finding his pants and computer. He wears it again only at the very end of the episode when he and Dean return to the Roadhouse to talk to Ellen. In Playthings (2x11), Sam is wearing it upon arrival at the Pierpont Inn. He takes it off when he’s just moving around inside the hotel, but he puts it on again when he and Dean go try to talk to Grandma Rose. He leaves it on until everyone has been saved and Rose is dead, and then understandably changes out of it because it’s soaking wet. In Roadkill (2x16), Sam wears it from when they encounter Molly until the end of the episode. (He is not wearing it in the flashbacks to the time before they encountered Molly though). In Red Sky At Morning (3x06), Sam wears it whenever they are outside (or in the car) and not wearing suits or tuxes, except the very last scene when they are driving. In Mystery Spot (3x11), Sam wears it during the 6-months-that-weren’t. 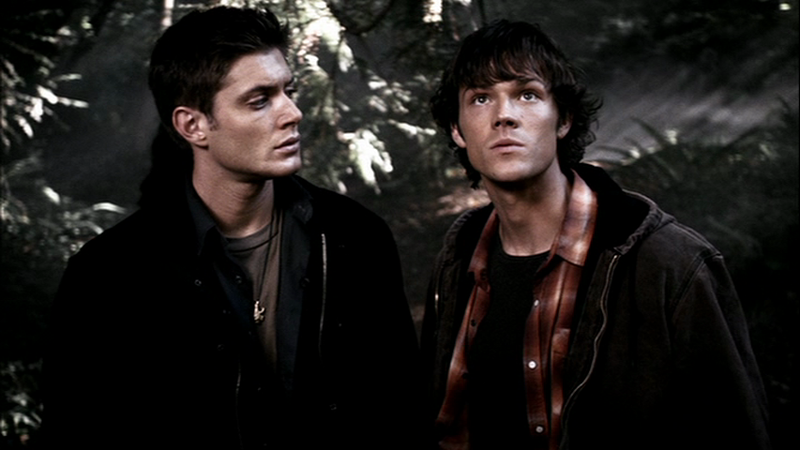 In Long Distance Call (3x14), Sam wears it when he and Dean go to the museum to look at the spirit phone. He then takes it off to sleep, but is wearing it again when we see Dean and him arguing about what “John” told Dean to do. He leaves it on for the rest of the episode. Sam wears the Superhero Hoodie every time he goes out during the flashbacks to Summer 2008 that we see in I Know What You Did Last Summer (4x09). In Criss Angel Is A Douche Bag (4x12), Sam wears it whenever he is NOT in the motel room after Jeb is killed. In After School Special (4x13), Sam wears it when they go to talk to Dirk McGregor Senior, and keeps it on until they get rid of Dirk’s ghost. In Changing Channels (5x08), Sam wears it during the opening theme when he and Dean are riding various bikes in the park. In Swan Song (5x22), we see Sam wearing this during the flashback to the boys sitting on the Impala looking at the stars. In Unforgiven (6x13), we see that Sam wore the Superhero hoodie when he and Samuel first worked the case in Bristol, Rhode Island. We see him wearing it as he and Samuel discuss the case in the restaurant, use Sheriff Dobbs as bait, and then leave town. I don't know what it is about this hoodie - but it holds a special place in my heart. Maybe it's because they boys were so young when he first started wearing it. I'd sell my soul to own this hoodie. 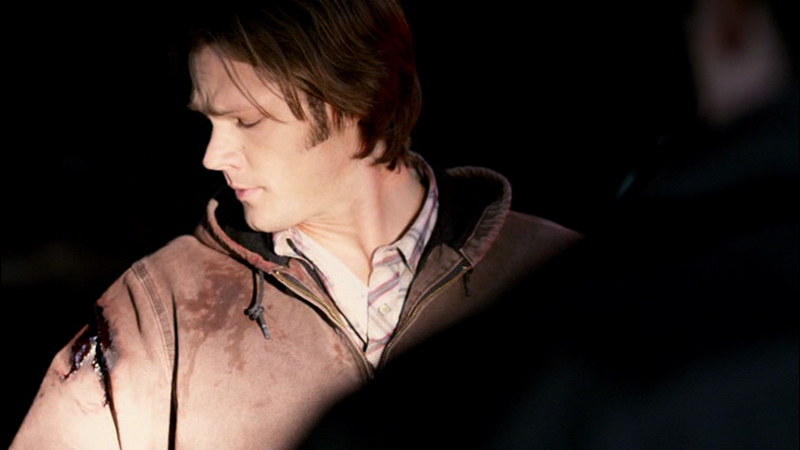 I think this got bloody/ruined in season six D: Soulless!Sam was wearing it when he attacked the cop in the spider episode. Has this been seen in S7? I can't remember... I do love it, though! I'm not sure. I kind of turn off that part of my brain while I watch the show live (otherwise I miss dialogue because I'm focusing too much on the clothes). We may just have to wait until the fall when I do my DVD rewatch! :O I love this hoodie! I will admit though, it looked VERY strange on Soulless!Sam. Awesome! I tried to buy it once, but I wasn't prepared for how huge Carhartt sizes were, so when it came, I realized that it was way too big for me to use practically...and I was unemployed at the time and needed to save money, so I returned it.